He is known for his role as Ronon Dex (2005&ndash;2009) on military science fiction television series Stargate: Atlantis (2004&ndash;2009). Most recently, he became recognized for his role as the title character in the sword and sorcery film Conan the Barbarian . Before the film, Momoa appeared as Khal Drogo in the HBO medieval fantasy television series Game of Thrones . An only child, Momoa was born Joseph Jason Namakaeha Momoa in Honolulu, Hawaii, and raised in Norwalk, Iowa, by his mother, Coni Momoa. His father is of Native Hawaiian descent and his mother is of German, Irish, and Native American ancestry. In 1998, Momoa returned to Hawaii, where he was discovered by international designer Takeo Kikuchi and launched his modeling career. In 1999, he won Hawaii's Model of the Year and hosted the Miss Teen Hawaii contest. In addition to his appearances in Stargate: Atlantis, and Game of Thrones, Momoa has appeared as Jason Ioane (1999&ndash;2001) in the action drama series Baywatch Hawaii (1999&ndash;2001). He then portrayed the title protagonist in Conan the Barbarian, a reimagining of the 1982 film of the same name and a role made famous by Arnold Schwarzenegger. 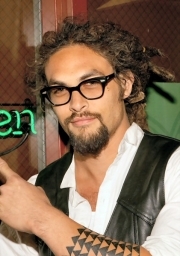 After the shooting of Stargate Atlantis Season 4 was over, Momoa had his dreadlocks cut off. Their weight had been giving him headaches, and even whiplash when filming action scenes. The program agreed with the decision and had planned to film a scene where Ronon cuts off his hair for Season 5's "Broken Ties", but that change was ultimately overruled by the Sci Fi network. On the first day of filming for Season 5, his dreadlocks were reattached, but the process was too taxing, forcing Momoa to switch to using his stunt double's wig until a custom wig could be made and delivered two weeks later. Momoa appeared as Roman in four episodes of the comedy-drama television series The Game . He is the nephew of surfers Brian Keaulana and Rusty Keaulana. On November 15, 2008, Momoa was slashed in the face with a broken beer glass at the Bird Cafe, a Hollywood, California club. He received around 140 stitches during reconstructive surgery, and his scars are apparent in his later work. A 21-year-old Venice Beach, California resident was convicted of the crime and is serving a five-year sentence at California Substance Abuse Treatment Facility and State Prison, Corcoran. Then he met and ultimately married Cosby Show star Lisa Bonet. Both were together since 2005, and got married in November 2007. On July 23, 2007, Bonet gave birth to their daughter, Lola Iolani Momoa. On December 15, 2008, Bonet and Momoa had a son, Nakoa-Wolf Manakauapo Namakaeha Momoa. The birth was first announced by Momoa's mother on the fan forums of his official site. She said that Nakoa means "warrior" and Mana stands for “strength/spirit,” while Kaua ("rain") and Po ("dark") pertain to the circumstances surrounding his birthday (he was born on a rare bad-weather night in Los Angeles). He shares his other middle name, Namakaeha, with his father. Whole or part of the information contained in this card come from the Wikipedia article "Jason Momoa", licensed under CC-BY-SA full list of contributors here.